Naperville, IL – November 30, 2017 – A new publication released by Digital Insurance describes the phenomenal growth of program insurance, with revenues doubling over the past six years. This stellar performance in an otherwise soft market has attracted carriers hungry for growth, but the author cautions that success with programs requires major preparation. 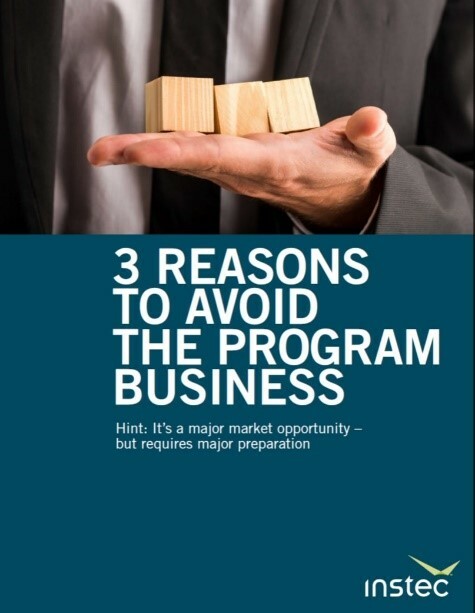 The white paper, sponsored by Instec, a leading provider of systems for program and specialty writers, is titled 3 Reasons to Avoid the Program Business. It explains that merely latching on to this thriving segment of the market is no guarantee that carriers will grow a profitable book of business. The paper describes three core requirements that carriers should consider before committing to programs: a massive culture shift, new cost management strategies, and a new approach to technology. The publication expands on the three core requirements, and explains the specific changes in culture, costs, and systems that carriers need to make to succeed with programs. There are many reasons to invest in program business, the author proposes, and for those prepared to adapt, it promises healthy returns. The white paper is available now, and can be downloaded from the Digital Insurance website. Instec’s unique approach to systems for the insurance industry enables P&C carriers, MGAs and MGUs to launch program and specialty offerings from cold start to first quote in as little as four weeks with near-zero technology risk. Instec's built-in bureau content and reusable code – a library of over 30,000 forms and 300,000 rates and rules – empowers carriers to get to market quickly and efficiently. Instec's cloud-based deployment and subscription-based pricing model also enables carriers to test new programs at a low cost of entry and scale up quickly and affordably as the business grows. To learn more, visit http://www.instec-corp.com.